Laurel Kerr lives each day fearing it could be her last. Years of pleading with God for deliverance from her husband’s deadly temper have convinced her that she’s beneath the Lord’s notice. Still, she perseveres, hoping that a redeemed husband and a Christ-centered marriage might one day be possible. Dr. Boyd Wendall has a soft spot for Laurel. Although she’s not his to take care of, she stirs his protective instincts. Time and again he finds himself in the midst of her trouble, and he can’t help but believe there’s a reason for it. When Laurel’s deliverance comes suddenly and unexpectedly, it raises questions about Boyd’s integrity, reopens wounds from his past, and leads to a trial the two cannot escape. Apart, they are just one man and one woman facing tribulation. Together, they’ll discover that God is not so far away. This was the worst part of every day. Laurel pulled hamburger casserole out of the oven and set it on the stove top as the truck door slammed outside. She took a deep, fortifying breath, gathering plates, knives, forks and napkins along with her courage, stomach churning as she wondered which side of his personality she’d be faced with when he came through the door. Tommy’s footsteps sounded heavy on the front porch. Angry. And the silence when they stopped seethed with fury. Or maybe not. Maybe she just imagined it. But, no. Her heart stopped for a second as she remembered. This morning Tommy told T.J. to pick up the mess left by a neighbor’s dog when it over-turned their garbage can in the night. Laurel closed her eyes and expelled a breath. T.J. came home from school with a fever, and a last minute trip to the doctor confirmed her suspicion that he had the flu. She’d sent him to bed, not giving a thought to the mess outside. Laurel jumped at Tommy’s shout from the living room, even though she had expected it. Footsteps came down heavy on the old hardwood in the living room. “In the kitchen.” She didn’t dare not answer. That would only make things worse. Setting the table gave her something to do and provided some activity that would, hopefully, deflect his anger. “I’ll clean up the mess outside after supper.” She put two loaded plates on the table alongside napkins and flatware. Tommy took that in, seeming to consider it seriously; seeming for an instant to feel some actual fatherly concern for one of his children. “Where’s Joshua?” He downed half his beer, temper cooling. “You took him to the doctor?” Tommy’s angry glare struck her seemingly from nowhere, then it pinned her. Too late, Laurel realized her mistake. Tommy’s fist came down on the table, and she flinched as dishes rattled. “That’s what?” He latched onto her arm and pulled her out of her chair, propelling her toward the wall, and then shoving her painfully against it. His hand slid up to her throat. “That’s not true,” she said softly. His hand tightened slightly as his eyes narrowed. It had been stupid of her to bring up the doctor. Her natural inclination to defend T.J. had overridden common sense. She and Tommy had this same fight on Saturday, when they had indeed run into Dr. Wendall at the hardware store and she stopped to chat for a moment. The bruises were healing. But still, she should have known better than to bring it up. Her husband never needed a reason to hold a grudge—even if it was over an imagined offense. “Is it not?” his voice was low, like a growl. She shook her head and turned her eyes to the floor so he wouldn’t see anything there he could use against her later. The meeting with Dr. Wendall had been innocent. He was the kids’ doctor, nothing more. But how could she resist the temptation to stop and converse with a man who always treated her with respect, warmth, and kindness? What was so wrong about interacting with someone who would talk to her instead of swear at her…someone who would shake her hand rather than slap her? Clearly, Tommy had sensed the longing in her heart for dignity and respect, and it terrified her that he could see her feelings so plainly. His hand slipped up to her jaw and he forced her to look at him, his fingers dug into her flesh and brought the sting of tears; tears which he instantly misinterpreted; probably as guilt. Laurel didn’t even have time to raise her arms in reflex before Tommy’s vise-like grip closed around her arms. He threw her to the floor where she slid into chairs and table, overturning dishes and sending at least one crashing to the floor. She scrabbled to her feet, but he was on her again immediately. He shoved her hard, and the impact her back made with the wall nearly took her breath. Tommy’s hand, poised to strike, came down slightly. There was no point expecting him to see reason, though she prayed daily that he would. And she prayed now as she saw renewed rage contort the face she had once thought so handsome. Lord, where are you? Deliver me from this, somehow. Tommy’s hand, curled into a fist this time, drew back, and Laurel squeezed her eyes shut, waiting for the blow. 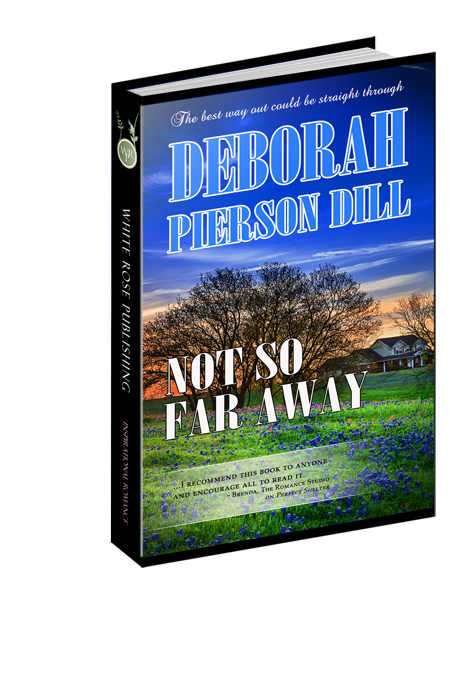 But the sound of a shotgun’s action behind them was unmistakable, and it stilled her husband. T.J. stood in the doorway with the firearm pointed at his father. His color was paler than Laurel had ever seen it, and perspiration filmed his face, but he held the weapon firmly in his lanky arms. “What do you think you’re gonna do with that gun?” Tommy took a step toward T.J., and T.J.’s finger went to the trigger. Laurel edged her way along the wall until she was as far out of range as possible. Tommy’s glare travelled from T.J. to her, where it took on an accusatory aspect, as if this was somehow her fault. A string of profane remarks punctuated each of his footsteps as he stalked back through the house and out the front door, slamming it so hard the walls shook. T.J. stood, strong and ready with astonishing coolness under the circumstances, until the sound of his father’s engine faded into the evening. Then, suddenly, the adrenaline seemed to drain away and he leaned against the wall. Laurel made it to his side quickly and took the shotgun from his trembling hands. She followed him to the living room, where he pulled back the lace panel and peered out the window. He sank onto the couch, holding out one hand for the gun. Laurel stared at his outstretched hand, clutching the weapon in both of hers. Only yesterday if he had wanted to handle his father’s shotgun she would have absolutely refused to let him. But today, he had saved her with it. “You should be in bed.” Hesitantly, Laurel handed the weapon back to him, and he set it gently on the floor at his feet. She went to the kitchen to get him a drink. “Do you think he’ll go to Grandma’s?” T.J.’s question followed her. T.J. nodded, eyes drifting closed. Her oldest son had experienced a good share of beatings. Laurel always stepped in, frequently diverting Tommy’s anger to her instead—trying to, anyway. But this was the first time ever that T.J. had stepped in on her behalf, preventing what was turning into an attack that might have left her needing medical attention. She smoothed shaggy brown hair out of her fourteen-year-old’s face. He wasn’t a man yet. But he wasn’t a boy anymore. Laurel had often wondered if the day would ever arrive when her sons would fight back against their father’s abuse. Evidently, today was the day.